As one of the largest specialist off-site manufacturing businesses in the UK, Caledonian Modular offers much more than your everyday construction company. Founded over 50 years ago, they supply around the UK from a 40-acre advanced manufacturing site in Newark, Nottinghamshire. Over the last few years’ Caledonian has achieved significant growth and now has a turnover of over £50m. A series of new contract wins look set to continue this success with a target of nearly doubling turnover by 2019, an objective they are will on the way to achieving. Mind you, this kind of performance hasn’t come about on its own, but from a clear vision for the company, backed by a strong management team, and a focus on projects that are aligned with its key strengths and sectors that it understands; education, housing and healthcare. These include an ability to achieve up to 94 per cent completion of building modules off-site, meaning buildings can be handed over in up to half the time it takes for a traditional build, and with less disruption to roads and nearby buildings. Underlying this ability to consistently deliver projects on time and within budget is a commitment to excellence through the use of BIM, design for manufacture and assembly (DMFA) and lean manufacturing techniques. A case in point is the £55m contract awarded to Caledonian by Laing O’Rourke to build the accommodation modules for Hinkley Point C (HPC) nuclear power station in Somerset. The contract comprises 1,496 en-suite bedrooms across 44 individual buildings at two locations. The first accommodation units rolled off the factory production line in March last year and were delivered 96% finished, ready for rapid completion. Each 34 bedroom block will be completed on site within just eight weeks from delivery. The entire HPC project is worth £18 billion across the board for the Nuclear Build programme, the largest modular government project across the entire country. Another recent success, in partnership with their partner architects HLM, involved securing first place on the modular framework to provide permanent, component-based buildings and facilities for the ESFA’s new secondary schools block replacement programme. They won this procurement competition with others from the off-site construction sector, securing top spot against 64 other bidders. Being awarded first place immediately secured two projects with a combined value of £12 million, with the potential to realise further schemes within the £250 million funding allocated to the lot. A track record of delivering these projects on time and within budgets means the management team can replicate their approach on each successive new contract – a great confidence builder with clients and main contractors. A case in point is the £25m contract awarded to Caledonian by Bowmer & Kirkland, announced in the last few weeks, for the 680 bedroom First Way Campus student development in Wembley. The ability of Caledonian’s modular building system to help meet the strict deadline dates on this project, which required handover in time for Euro 2020, helped secure this contract. As did their pre-engineered fire compliant modular solution suitable for a high rise development, which rises from 7 to 11 floors. Other recent contracts wins include the MOD Single Living Accommodation (SLA) for MoD Lyneham in Wiltshire as part of a £35m Kier development. 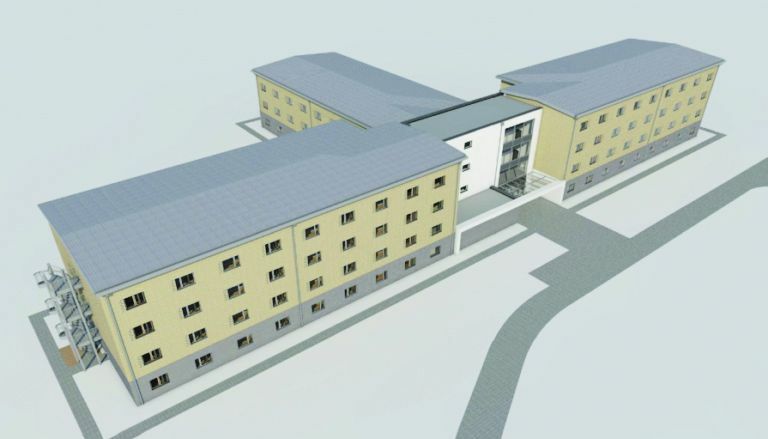 Part of the Army Basing Programme, the project will create 296 rooms over 5 blocks, providing accommodation for troops returning from overseas and relocating within the UK. The latest contract continues a long partnership with the MOD, with the team successfully completing 1,145 rooms over 12 blocks on the same base for Kier in 2012/13. Caledonian Modular prides themselves on the fact that their projects look as authentic as a traditional-build, indeed they are indistinguishable, while remaining as efficient and cost-effective as they do. By sticking to what they know – modular and off-site construction systems – underpinned by BIM, DFMA and lean manufacturing, this Nottingham based company is raising industry standards and demonstrating how modular buildings have the ability to resolve the UK’s building shortages quickly and efficiently. To find out more about Caledonian’s modular building system, visit www.caledonianmodular.com. Alternatively, call 01636 821645.